Core Losses (15-25%): consist of EDDY CURRENT and HYSTERESIS losses. Eddy Currents are circulating currents found in ferromagnetic materials as magnetic fields are induced into them. They are reduced by using thin core materials insulated from each other. Hysteresis is the energy necessary to change the direction of the magnetic fields in the steel. This is reduced by creating a core material that is low in carbon, or silicone-based, magnetic grade steels. Summing the eddy current and hysteresis losses will provide the total core losses for any given motor. Assuming that the motor exhibits one of the failure modes discussed above, the stator will have to be ‘stripped,’ meaning that the copper windings will have to be removed, before re-insulating and rewinding the motor. 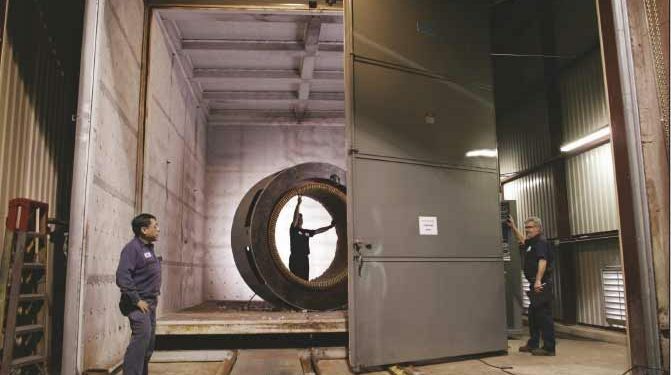 The best practice is to perform a core test before and after the stator is stripped. The wattage per pound of steel loss should be recorded and should not be found to increase or decrease. DIRECT FLAME: A flame from a torch or other source is directed onto the core and winding. In some cases, the stator is physically placed in a bonfire! The temperature is uncontrolled and severe damage to the core will occur. The varnish is reduced to ash and the windings removed. 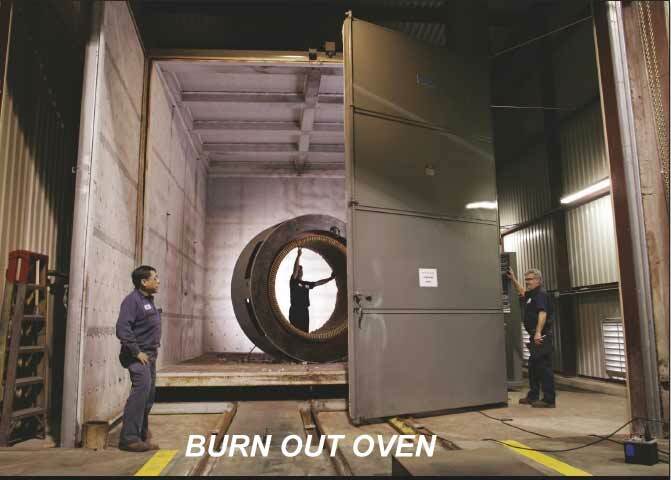 BURNOUT: The stator is placed into a burnout oven is set for a recommended temperature of 650oF (345oC). It is kept at this temperature until all of the varnish and insulating materials are turned to ash (eight or more hours). If the temperature exceeds this value, damage to the stator core and frame distortion may result, reducing motor efficiency, mechanical reliability and increasing soft-foot. MECHANICAL STRIPPING: (Hot Vapor Process Chemical Stripping): A stator is submerged in a bath of non-chlorinated petroleum-based solvent at a temperature of 370oF (190oC) for a short period of time. The coils are then removed with high-pressure air. Once the windings have been removed, the stator may have to be cleaned. This may be done by steam cleaning and baking, bead or cob blasting, or low-pressure air. In some cases, additional copper that may have fused to the core at the time of motor failure will have to be removed. This is done with a small air grinder or jewelers’ files. The stator should then receive a loop test, or core loss test, which is performed to check for hot spots within the stator core caused by shorted laminations. If these are found, they may be removed by separating the effected laminations and insulating them, then pressing them back together. Other methods include a dip and bake before rewinding or vacuum pressure impregnating the stator core. In some cases, the core losses or hot spots may be excessive, requiring that the stator core be re-stacked or the motor replaced. The damaged core is completely dismantled and separated into individual laminations. These laminations are then cleaned, sanded and insulated with an electrical insulating varnish used for insulating core plate; this is a very expensive, time consuming and ties up valuable shop personnel and shop through put. The alternative choices of applying Core Plate to the core laminations have been attempted and used, such as the use of iron oxide, sodium silicate, hydrogen peroxide and various acids coating types, all of which have their own individual draw backs. They are very labor intensive, expensive, tie up shop time; as the alternative processes mandate coating each lamination, reassembling the laminations and ensuring there are arranged geometrically correct. In contrast; The Insul-Core™ Solutions process provides a complete process that does not require the laminations to be disassembled.